Table Rock Lake is massive and incredibly popular; visitors come from everywhere to enjoy its clean, clear warm water through a variety of recreational activities. You can access the lake from any number of small boat docks and other landing areas around this beautiful body of water, but there are three full-service marinas accessible to the public on Table Rock Lake in this area; in Branson you’ll find the State Park Marina, which features scores of services and rentals; in neighboring Kimberling City, there’s the Port of Kimberling Marina and their nearby What’s Up Dock? that includes boat slips, WaveRunner rentals, and boating accessories and supplies; and on Indian Point, home to Silver Dollar City and lakefront lodging, there’s Indian Point Marina that boasts an exceptional floating cafe. Port of Kimberling Marina can be found in neighboring Stone County, approximately 15 to 20 minutes from Branson, and just a hop, skip, and jump from Silver Dollar City! They offer boat storage and a variety of water craft rentals that include ski boats, WaveRunners, pontoons, and houseboats. They also have a fuel dock, SeaTow, boat sales, and a floating café. Their boat storage includes both wet slips and dry storage spaces for boats of all sizes. Their Coyote Dockside Café & Pub features cozy table dining and a handy take out service. There’s also an onsite fishing guide service and a boat cleaning service. Port of Kimberling hosts an on-water boat sales company that stocks both new and pre-owned boats of all kinds; they also sell boat lifts and offer boat maintenance and marine insurance. 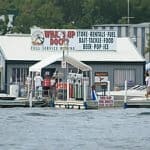 At the marina’s What’s Up Dock?, you’ll also find water recreation vehicles, as well as a store with ice, snacks, water, beer, lake apparel, and boating accessories. Additionally, they offer full-service holding tank pump-outs. When it comes to the lake, Port of Kimberling makes it easy to stay where you play! The Port of Kimberling Resort has units with kitchenettes, and there’s a business center, pool, and hot tub. Several of the rooms include great views of the lake. Their cabins include modern amenities and fully equipped kitchens, as well as tennis, basketball, and volleyball courts. Ask a vacation services specialist at Branson Tourism Center about staying at the Port of Kimberling. At State Park Marina, located one mile south of Table Rock Dam, you’ll find just about everything you need to enjoy Table Rock Lake; boat rentals, including both fishing boats and pontoons that are ideal for swimming trips; WaveRunners, water skiing, tubing, paddleboarding, parasailing, scuba diving, guided fishing, a even a catamaran sailing boat. Open for eight months of the year, the Marina features 600 boat slips, a store, a full service dive shop, dining at Danna’s BBQ, and treats from Hawaiian Shaved Ice at the Oasis. 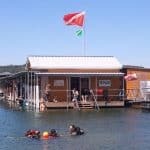 State Park Marina employs a professional dive instructor so he can get the most from your dives in the lake, and become an open water SCUBA certified diver. There’s a parasailing service that offers eight to ten minute rides using the latest, and safest, technology. You can also rise above the water on a Flyboard; the marina has certified instructors to assist you. Although no previous experience is necessary, you must be at least 15 years of age to enjoy this sport. They also offer SUP — Stand Up Paddleboarding, a great way to get a full body workout. 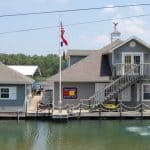 Their marina store carries Table Rock apparel, aqua socks, nautical accessories, batteries, sun block, towels, bait and tackle, maps, and more. Indian Point Marina features a wide array of water craft rentals, including pontoons, tri-toons, deck boats, ski boats, and WaveRunners. They have fuel and a handy pump-out station, as well as a tackle store that stocks live bait, tackle, groceries, and camping supplies; they also issue fishing licenses. Boating supplies on hand at Indian Point Marina include lights, anchors, fuses, batteries, props, oil, fuel additives, line, and fire extinguishers. Other supplies you’ll find include sunscreen, clothing, sunglasses, and snacks. Indian Point Marina offers services for a variety of lake activities, including diving and skiing, and the services of an experience, professional fishing guide. Their floating café features two stories and an excellent menu for breakfast, lunch, and dinner. There’s climate-controlled dining inside, as well as fresh-air dining with an incredible view. As you can see, it’s easy to access Table Rock Lake and discover a variety of water-related services in the Branson area. Whether you’re fishing, zipping along in the water, or flying around above it, there’s a nearly endless list of ways to enjoy the lake; contact Branson Tourism center for assistance finding the lake services you need, as well as a great place to stay, and fabulous shows to see when it’s time to dry off and enjoy some live entertainment on the Branson stage!